a) Make a detailed budget of your costs required to bring your idea to life. Use this to set your project’s funding goal. c) Have a plan to market your project so that it can reach to maximum people. d) Be active before launching your project till it reaches it’s funding goal amount. a) Click on ‘Start a Project’ button or link. b) Select the package with the feature set you need for your project. c) Fill the required details in the project creation form which you have gathered before starting this process. d) Go to dashboard of your project to compile overview, to configure payment gateways, to create various rewards, to add videos / photos, to set main photo / video for your project etc. What should I consider while setting up funding goal for my project? Your funding goal should be the minimum amount of funds you need to complete your project along with make and ship of rewards. Make a list of all the materials, resources, and expenses you'll need to complete your project, and the estimated costs for each. Share a breakdown of this budget in your project description to show backers you've thought things through. What are the different payment gateways which I can enable for my project’s backers? What information should I share about my project on its profile page? a) What is your project as all about. b) How you will bring your project to life. c) How the funds collected will be used. d) The identities of the people on your team (if you have one). Also, your project page should tell your story and include an eye-catching project image or video, and some attractive rewards. The more information you share, the more you will earn your backers’ trust. How do I include images or other media in my project overview? You can include photos, links, videos etc. in your project overview via TinyMCE editor. TinyMCE offers HTML formatting tools, like bold, italic, underline, ordered and unordered lists, different types of alignments, in-line placement of images and videos, etc. It allows users to edit HTML documents online. The different options can be configured at the time of integration with a project, which improves the flexibility of a project. What are image specifications for project pages? Your project image size should be 680x1400 pixels. Recommended file types are: JPG, JPEG, PNG, or GIF. What does estimated delivery date mean? The estimated delivery date for a reward is the date you expect to deliver that reward to backers. If you're offering more than one thing in a single reward tier, set your estimated delivery date to when you expect everything in the reward tier to be delivered. If you're not sure what the estimated delivery date is for a reward, take some time out to create a timeline for your project so that you have a good sense of when you'll complete it. Choose a delivery date that you feel confident about and will be working towards. Rewards are generally items produced by the project itself — a copy of the album, a print from the show, a limited edition of the comic, naming characters after backers, personal phone calls etc. Yes, there is a way to limit the quantity of a reward. You can do so while creating the reward, select the ‘Limit Quantity’ checkbox and enter the limit for backers who can choose this reward while backing your project. You can charge shipping cost for rewards selected by backers of certain places. To do so choose the location where you want to ship your reward and add the shipping charges in the textbox appearing along with it. This shipping cost will be added to the amount set for that reward when a backer selects the reward to fund your project. I am unable to edit my Project. What might be the reason behind it? 1. Published Project with at least 1 Backer: When a project is in draft mode, it is not finalized so all the details related to that project are editable. But, once a project is published and is backed by at least one backer then few fields are non editable like: Project Duration and Funding Amount. If Project Owner still wants to edit the published project then he can contact to the site admin. Site admin can take proper action in such scenario and do the needful changes. I am unable to delete my Project. What might be the reason behind it? 1. Project Backer’s: When the project is funded even by a single backer. 2. Member Level Settings: ‘Allow Deletion of Projects?’ is disabled for the member belonging to the particular member level. If Project Owner still wants to delete the project then he can contact to the site admin. Site admin can take proper action in such scenario like: to refund the backed amount to the respective backer and delete the project. Is it possible for a project to be funded more than the set goal amount? Yes, it is possible for a project to be funded more than the set goal amount or more than 100%. Is it possible to run a Project without creating any rewards in it? I am unable to find the link to create rewards in my Project, from where I can do the same? Yes, it is possible to run a Project without creating any rewards in it. There is always one option to back the project with any desired amount and that is without selecting any rewards. 1. Open the profile page of the project. 2. Now, go to the dashboard of this project. 3. Click on “Rewards” from the options displaying on left side of the dashboard page. 4. Create / edit / delete various rewards from here. I am unable to edit / delete my reward of my Project. What might be the reason behind it? 1. 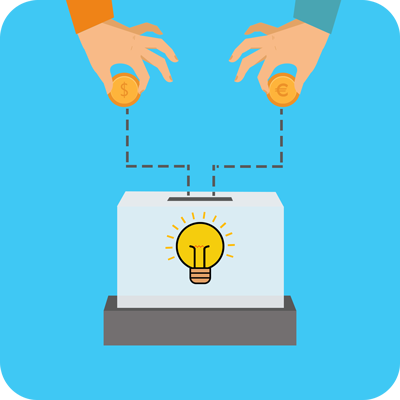 Reward Selected: Once a reward is selected by even a single backer then few fields become non editable like: Backed Amount, Estimated Delivery, Shipping Details and Reward Quantity. 2. Project Completed: Once a project has reached its goal in defined set of time, rewards of these projects cannot be edited or deleted whether it has been selected any backer or not. If I choose a subcategory, will my project also show up in the main category? Yes. For example, if you have started an art based project and you put it in the Art subcategory i.e. Design, your project will appear in the both Art and Design category / sub-category. Yes, you can run more than one project at once. But, we recommend you to focus on one project at a time as it requires lots of your effort, time and patience. Yes, your project will be live automatically once it is approved by site admin. You should start planning as soon as you decide you want to run a project. Start by thinking through who your existing fans and contacts are and organizing their information into an actionable contact list. Choose different social media’s and ways to promote your project. This way it will reach out to maximum people. You can also ask your friends, family members, team members etc. to spread the word about your project. a) You can change your promotion strategy. b) Ask friends and family to share your project with their networks. Getting your project beyond your immediate supporters can only help. c) Share your project via blogs, newsletters etc. Where can I find my project ? You can find your created projects, backed / liked / favorited projects at one place, i.e. at ‘My Projects’ page. You can track your project’s progress from ‘My Projects’ page or from the project’s profile page. What is my responsibility for answering questions from backers and non-backers? Backers: You can contact your backers from ‘Backers Report’ section of the dashboard of your project. You can compose message for specific backer or all backers at once. Non-backers: The members who are interested in your project and wants to contact you before backing your project, can do so via ‘Contact me’ button placed on the project profile page. Yes, of course! You can always try again and relaunch with a new goal, whenever you're ready. Before relaunching, we recommend taking some time to review your project to see what might be improved the next time around. What do I do if I miss my Estimated Delivery Date? The Estimated Delivery Date is intended to set expectations for backers on when they will receive rewards. Setbacks are possible with any project — creative ones especially. When the unforeseen occurs, creators are expected to post a project update explaining the situation. Sharing the story, speed bumps and all. Creators who are honest and transparent will find backers to be far more forgiving. We’ve all felt the urge to avoid things when we feel bad about them, but leaving backers in the dark makes them assume the worst. It not only reflects badly on the project, it’s disrespectful to the support that community has given. Regular communication is a must. What should I consider when I'm planning to relaunch my project? a) Your project's goal and budget. b) Your supporters. Did you let your supporters know about your project? To communicate with your backers, you can post announcements in your project’s profile page. You can also start a discussion if want any opinion of your backers. You can see backers name, amount funded, payment method and mode used while backing your project.